Heat preserving cover of disassembly style pipeline (which also called temperature holding quilt, heat insulation cover, soft temperature holding cloth, profiled temperature holding) is a new generation of heat-preserving product which exploited by our company basic on absorbing foreign technology, it fills up blank on this field within our country. 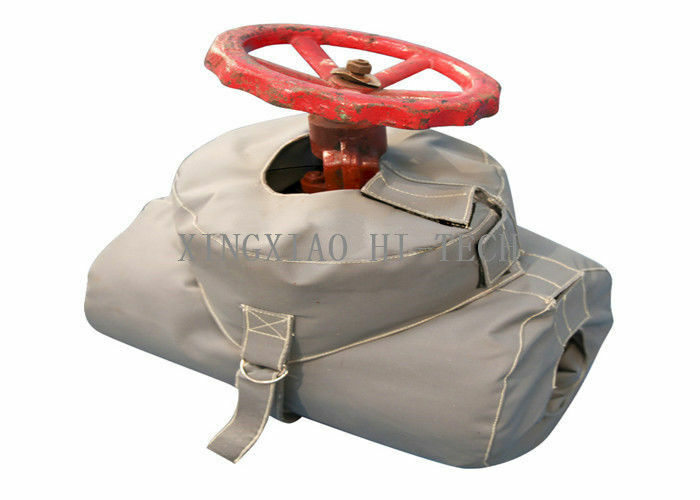 It is sewed with internal pad, middle heat preserving layer and external protecting layer, which processed by special technics with aboratively design and mapping according the size, using environment of pipe and equipment. This product could be used on insulating heat and temperature keeping for different size of pipeline and other kinds of cold-heat equipment. It is practical for pipeline equipment in case of frequent taking-off and maintenance which make it very economically. And it is the perfect choice for industry energy saving, temperature holding. 5). waterproofing, oil proof: high hydrophobicity, oil proof. 9). Improve working environment, avoid workers be scalded. at present it is a high grade pipeline heat preserving material, and widely used in various pipeline, warm-ventilation air-conditioning equip of petroleum, chemical, filature, metallurgy, electricity, construction, kiln stove, paper-making, pharmacy, shipping, etc. 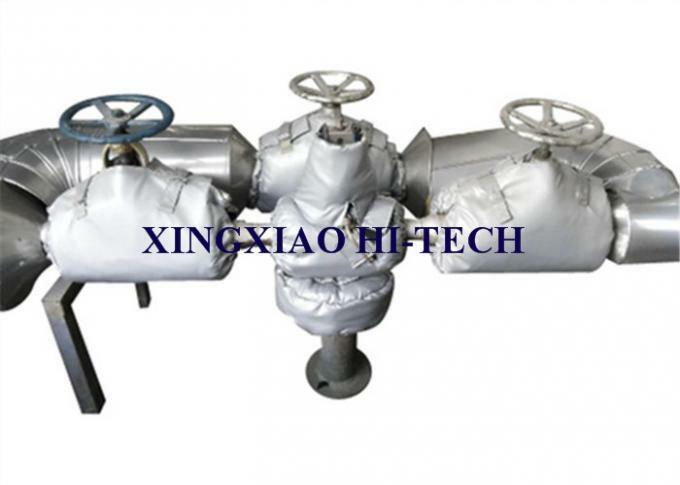 it is suitable for various pipeline heat preserving and is an ideal pipeline heat preserving material. For example, pipeline, elbow, flange, valve, tie-in of pipeline, chemical reactor, equipment, air machine of fire power or nuclear power, instrument box and exchange equipment used in high temperature environment of steel factory, and other profiled part. 1). inter temperature-hold type: keep the inter temperature of the protecter, by this to stop heat exchange of the inter and outside energy (convection, radiation, and transfer), make sure the temperature of production, increasing the efficiency of heat energy, this will save energy. 2). resisting outside-radiation type: resist strong outside heat radiation to keep away the outside heat transfer to the inside which may impact the working temperature of the protecter and harm to the equipment, part, instrument. 3). Antifreezing type: resisting ourside low temperature impact the working temperature of protecter. This type is mainly used to protect pipeline, equipment, instrument. The material used to make this covering is decided by the locale request. 4). Keeping low temperature type: keep away the outside heat transfer to the inside which may impact the low-temperature protecter. 5). Calefaction type: to satisfy the request of production, or resist freezing, the equipment and pipeline maybe need to be heat up, meanwhile it needs to have covering to keep the temperature. Wuxi XingXiao Hi-tech Material Co., Ltd is located in Jiangsu Wuxi. It is close to Shanghai and Nanjing, which is very convenient for customers to come here. Our company was founded in 2010, one of the suppliers in China to produce fiberglass fabric , fireproof coated fiberglass fabric, fireproof & insulation thread, rope ,sleeve, fireproof blanket & suit, and detachable non-metallic connector and cover. 2. Well-trained and experienced staffs to answer all your inquiries in fluent English. 3. All our products have 1-year warranties. 4. Offering the support to solve the problem in the application or selling period. 5. Competitive prices based on same quality. 6. Guarantee samples quality same as mass production quality. 3. Best quality and Best service with competitive price.